The Art of Braiding, Romal Reins ll is the second and more advanced book in the Romal Braiding Series. As in The Art of Braiding, Romal Reins 1, information and skills are taught in a clear and comprehensive manner with numerous detailed illustrations. Instruction is specific to the refined fancy Santa Ynez reins, a variation of the traditional romal reins, made from kangaroo leather and kangaroo rawhide. There are familiar and new button patterns and every effort has been made to make these button pattern instructions easier for the braider to learn. There is also a discussion about what makes these reins have an elegant look. A convenient String Chart contains all necessary string lengths for each button along with the number of buttons required. The final chapter is dedicated to an exceptional leather and rawhide braider, Ernie Ladouceur. Included are photographs of some of his original work, notes on his methods and a scan of his hand drawn diagram illustrating his method for Curing and Preparing Rawhide. "The Art of Braiding, Romal II"
The Art of Braiding - The Basics - Second Revised Ed. 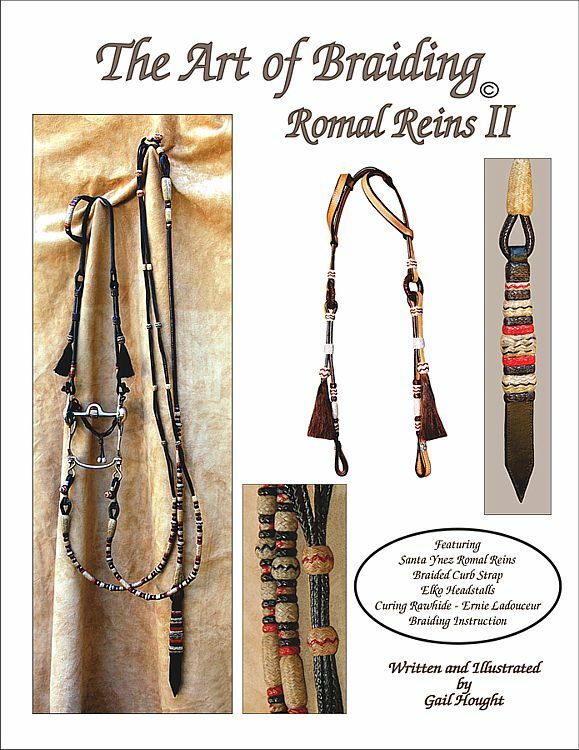 The Art of Braiding , The Bosal I - Rev.